Those passionate about food often say it is a path that leads to divinity of the body and soul. Maybe that?s why food has always been an integral part of every ritual. 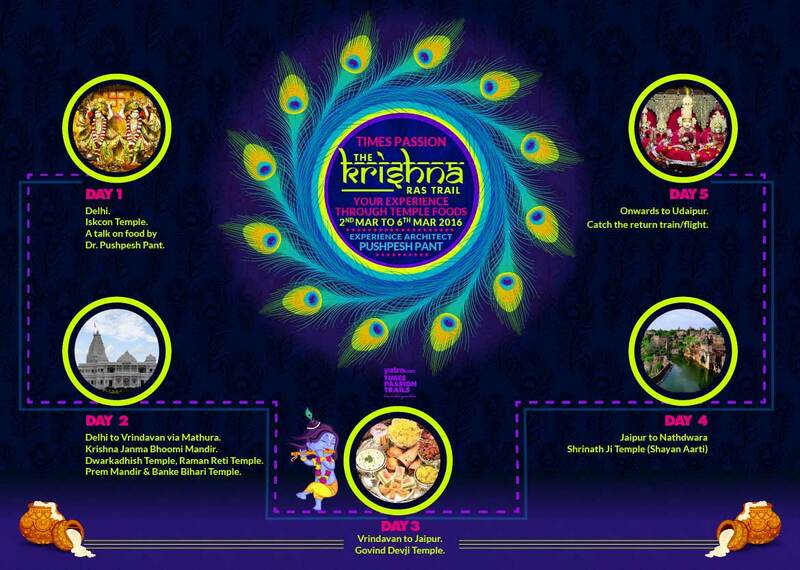 The Krishna Ras Trail explored various godly meals. Experience Architect, Prof. Pushpesh Pant, tantalised our taste buds and hearts as he walked us through various temple foods of Delhi, Mathura, Vrindavan, Jaipur and Nathdwara. The 5 days trail helped us explore eats served at the ISKCON Temple (Delhi), Raman Reti Temple (Mathura), Shrinathji Temple (Nathdwara) and much more. It was a trail full of the famous pedas, sattvik cuisine, indulgent prasads and bhogs. All this while we witnessed various aartis and Gods' abodes. Pushpesh Pant is a noted Indian academic, food critic and historian. He retired as a Professor of International relations from the Jawaharlal Nehru University, Delhi. He is one of India's leading experts on International Relations as well as Indian cuisine, and as a columnist has written for a number of major publications like Forbes, Open, Outlook, Times of India and The Tribune. Professor Pant has a teaching experience of 32 years at the Delhi University and the Jawaharlal Nehru University. He has supervised over 25 PhD and 75 M.Phil. Degree holders. He has served on the Court of JNU as well as on the Executive and Academic Councils. He has published widely on travel and tourism, with over a dozen books to his credit. His book, India: The Cookbook (2011) was named by The New York Times as one of the best cookbooks of the year. The Government of India awarded him the civilian honour of the Padma Shri in 2016.